When it comes to imagining the perfect family Christmas, you surely couldn’t create a list that didn’t have panto somewhere near the top. The lack of traditional family panto in Brighton was something that we at E3 felt needed addressing, so for Christmas 2017, we produced Cinderella. The idea was warmly welcomed by the people of Sussex and beyond. A nationwide search for Cinderella began, and we were initially contacted by more than 300 people. Open auditions were held in Brighton in September, and more than 60 people arrived from as far away as Scotland. Some tough decisions had to be made, but Hannah Bailey was the eventual winner. Those who came to see the panto will agree that we definitely made the right choice when we picked our Cinders! Our performance schedule of 13 shows kicked off on December 22nd, and ran through to December 28th (with a welcome break on Christmas Day). 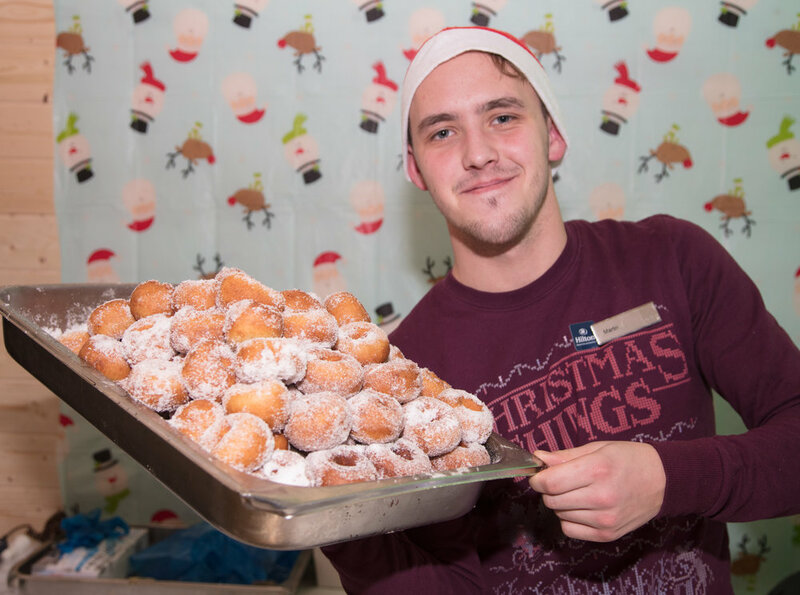 There was also a Christmas Fayre full of food and drink for our fans of Cinderella to come and enjoy before each show. 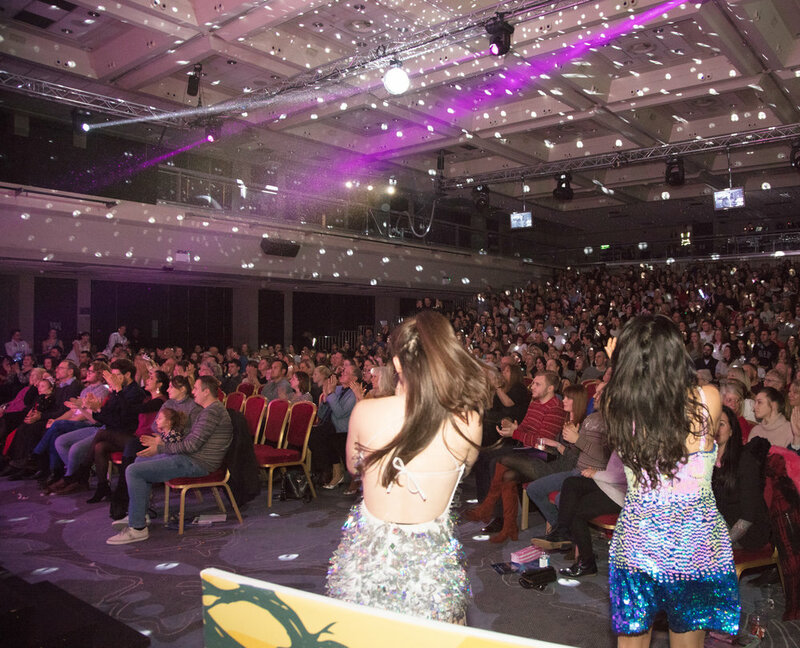 The Hilton Brighton Metropole was the venue for both the Fayre and the performance, and we welcomed more than 7,500 people through the doors in total. Upon entering the auditorium, many were surprised by the large screen that was used as a backdrop for the panto, with artwork designed in-house by E3’s graphic designer Danilo. 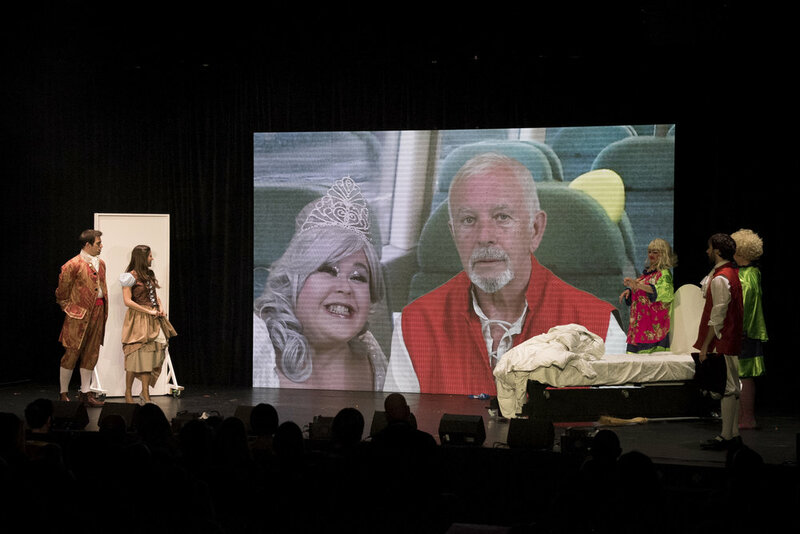 The screen was also used for our very special video guest star David Essex, whose tale of being lost aboard a Southern Rail train for the many years made the whole crowd laugh. The first seven shows from December 22nd to 26th were completely sold out, such was the massive response from people wishing to come and see Cinderella. 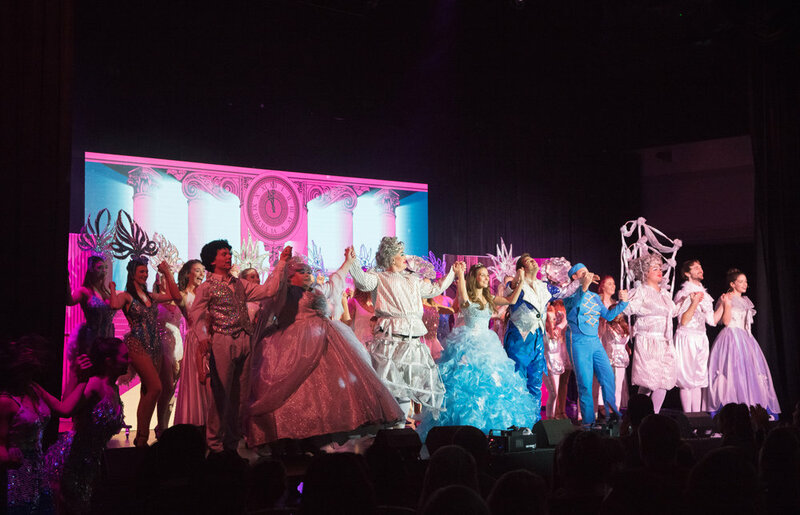 Laughs were had by adults and children alike as the West End cast danced, sang, and performed their way through the two-hour long show. David Hill of E3 also featured in the cast, portraying one of the ugly sisters, in what marked his return to panto for the first time in 13 years. He starred alongside Alasdair Buchan portraying the other ugly sister, in a pairing that caught the eyes of many. 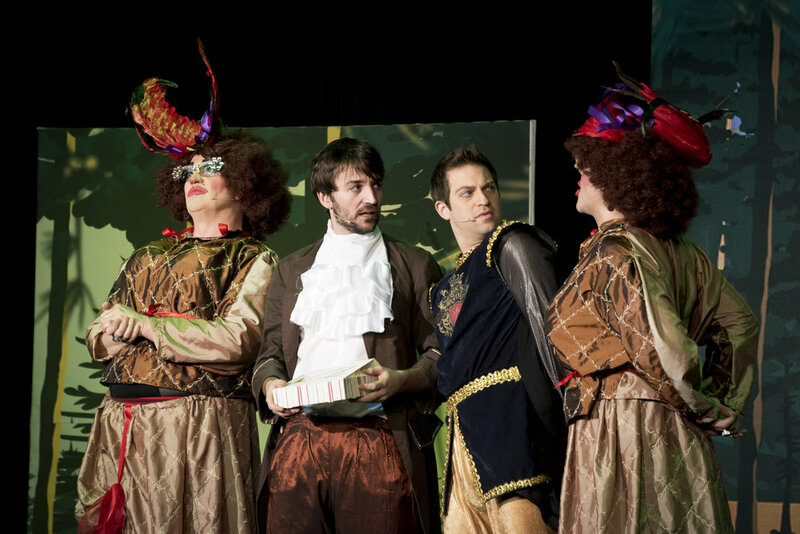 We also had the pleasure of casting Lou Nash and Alex Baker from Juice 107.2’s breakfast show to make appearances as Lord and Lady Chamberlain. 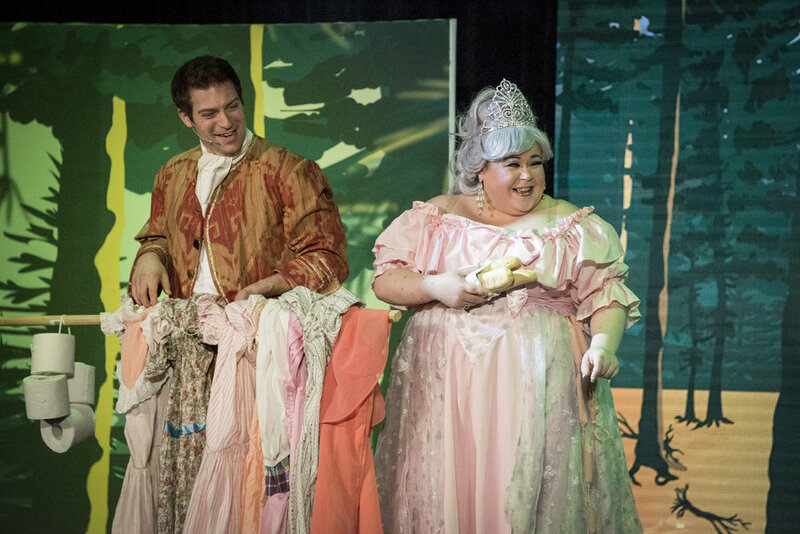 Praise went out to each and every cast member, but an obvious stand-out to start with was Keris Lea as The Fairy Godmother. Keris’ band ‘The Sundaes’ are signed exclusively to McKenzie Associates, and her singing ability lit up the room. She was undoubtedly the perfect fit for the part. 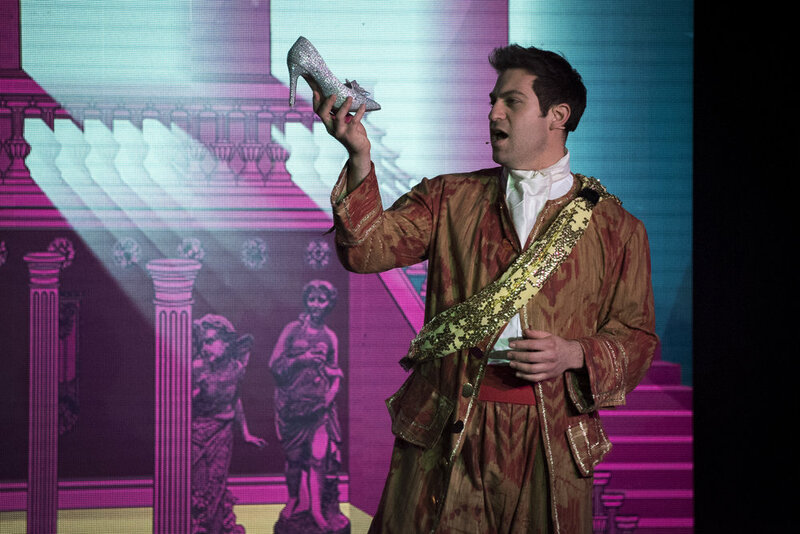 Praise was also lauded upon The Prince (Jon Robyns) and Dandini (Joseph Peters), for managing to form an on-stage partnership that will live long in the minds of many. Throughout rehearsals, they seemed to almost become a comedic double-act, and this transferred perfectly to the stage. This was especially prevalent during the 12 days of Christmas song, in which Dandini managed to cover most of the front 5 rows in onion rings. Undoubtedly a favourite of the children would have been Dean Kilford as Buttons, who smiled all the way through his performance, and even did a singalong with some children from the audience. His ultimately doomed quest for Cinderella’s love earned him many a sympathetic ‘aww’ from the audience. Our production ran it’s 6-day course without a hitch, and we are already looking forward to bring Aladdin to Brighton in December 2018. We would like to thank every single person who came along to see Cinderella, as in doing so you helped raise awareness and money for four local children’s charities that lay very close to the heart of E3; Chestnut Tree House Children’s Hospice, Chailey Heritage Foundation, Rockinghorse, and The Starr Trust. Cinderella marked event two of twenty for E3’s project 20; a series of diverse events throughout 2017/18 that mark the twentieth anniversary of the company’s foundation. Project 20 is aiming to raise £20,000 to be spread out evenly between 5 local charities. Cinderella was a co-production between E3 and the Brighton Academy. McKenzie Associates was proud to support and sponsor this fantastic event.